Over the past few years, I have become somewhat of a Goldilocks of commuter bicycles. I'd go to swap meets, read every blog post review online about certain frames, drive all the way to Santa Barbara to test ride bikes and check Craigslist regularly to find what I thought would be my "perfect" fit bicycle. As a petite girl standing at 5'2", I was frustrated by what seems like a bicycle industry fit for taller people. I'd set my search alerts for small frames, scanning for "48 cm" sized bikes. Last month I visited Japan, a country full of all sorts of bike riders. 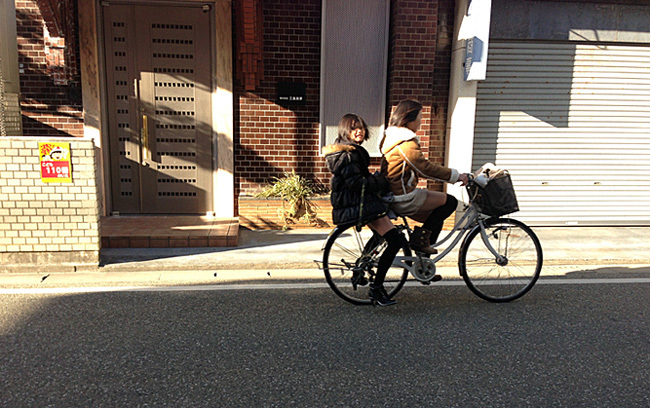 And after watching so many Japanese students and even grandmothers, shorter and younger than me, casually and gracefully ride around town, I'd realized I'd been looking for the wrong thing. Even on rainy, snowy winter days, I'd watch people pedal up and down the street with only one hand on the handlebars - and the other hand balancing an umbrella. How did these bikers achieve perfect balance, while hauling their book bags and groceries? When I test-rode my high school cousin's bike, I realized one thing off the bat -- the smaller wheel size. With smaller wheels, I could pedal easily on a heavy bike with a basket full of groceries, even with an umbrella in my hand. That's something I could not do on my road bike, even though it has a basket. As I'd started to read more about bicycle frames and geometries, particularly Grant Peterson's Just Ride guidebook, I'd come to the conclusion that I'd have to find a bike with smaller wheels too, just like those Japanese student bikes. Peterson explains it quite simply: for the smallest of us riders, a smaller wheel is necessary. Unfortunately, most bikes on the American market these days have the industry standard 700 C wheel, which is 622 millimeters in diameter (Take a look at Sheldon Brown's bike tire size charts) And we can't fly out to Japan just to buy a bike. Stay tuned next week for shopping tips for the petite, critical commuter!